Coco Chanel once said, "Scheherezade is easy; a little black dress is difficult." What Mme. Chanel meant was that it's way harder to manipulate a plain piece of black cloth into "the" archetype of chic, cool, sophistication than to charm the pants off of a jilted king so he doesn't chop your head off. There's an L.B.D appropriate for every situation in which you might find yourself and this explains why most women probably have at least a dozen of them in their closets of varying lengths, materials, and silhouettes. Everyone also knows that black masks whatever "problem areas" one might be fixating on at a given moment. I just finished my fifth inflation and I can safely say, "Houston, we have a problem." I am definitely in need of something a little more strategic than a statement necklace to camouflage my upper region. All of these silhouettes offer a lot of coverage without looking like you have something to hide (not to mention they are timelessly elegant and effortlessly cool.) The draping allows the fabric to gracefully float across the body without creating any sharp outlines. More fullness on top begs for a little skin reveal below. If you've got great legs, this look should be your go-to. 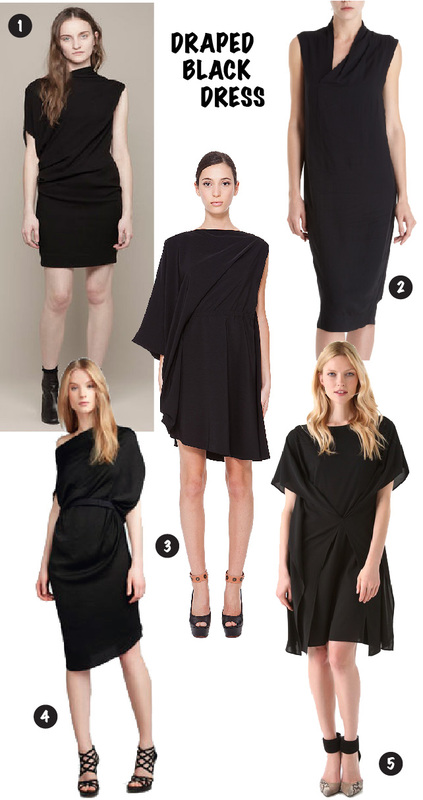 Personally, I think the mid-calf length dress from The Row (look #2) is absolutely sublime.